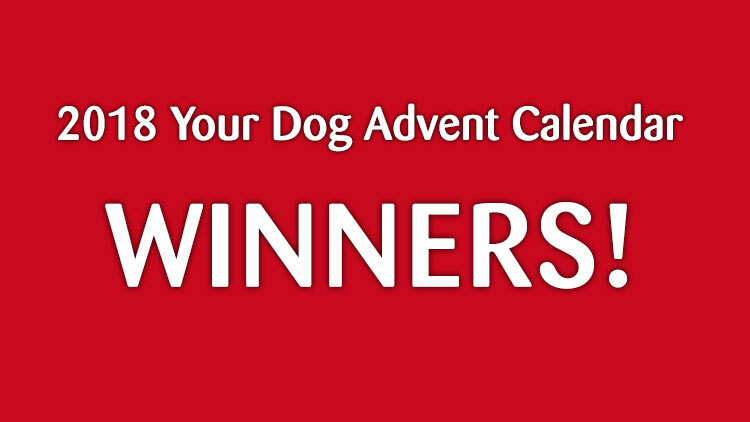 The 2018 Your Dog Advent Calendar winners! Abi Kay, Nicola Derbyshire, Nicola Derbyshire, Jenni Noble, Penny Woodyer, Darren Liscoe, Wendy Ashby, Dave Pearce, Faith Marks, Lynne Thomas, Pam Morris, James Tupper, Jude Mayhew, Paul Michael Arthur Thompson, Louise Ackerley, Christine Ball, Gerri Hickman, Anne Gavin, Kate Turner, Claire Blaney, Alison McKenzie, Sam Ashmore, Susan Miller, Micki Hobbs, Hayley Atkins, Ian Ferguson, Victoria Prince, Angela Mcdonald, Beth Jackson-D'Zacchaeus, Nancy Bradford, Sandra Siddall, Monika Bascombe, Pete Cleasby, Pam Young, Carol Bell, Nicki Ramsay, Audrey Tebbs, Katherine Evans, Jan Johnson, Richard Twist, Sarah Purnell, Simon Collinge, Janine Phillips, Rebecca Hodson, SUZANNE DRUMMOND, Carol De Brikasaan, Lisa Williams, Stuart Bayley, Janette Crolla, Anna Gleave, Rob Griffiths. Thank you to all those who entered! See you next year!